"We've never seen this kind of resolution in Hubble images"
Mars makes close approach to Earth..
Mars and Earth have passed closer together than at any time in almost 60,000 years. The historical event happened at 1051 BST (0951 GMT), when the two planets were 56 million kilometres (35 million miles) apart - about the closest they can get. Stargazers in parts of the southern hemisphere gathered at observatories to view the Red Planet as night fell. The mysterious planet is visible as a bright orange object in the night sky, outshining any other celestial body except the Moon and Venus. Amateur and professional astronomers are taking advantage of the orbital rendezvous to train their telescopes on Mars. Even the orbiting Hubble Space Telescope is pointed at the Red Planet to take detailed pictures. It has captured a remarkable image showing the planet's southern polar ice cap and the huge impact crater known as Hellas basin. The picture is being described as the most detailed full-globe shot of Mars ever obtained from the vicinity of Earth. "We've never seen this kind of resolution in Hubble images, that kind of detail," said astronomer Jim Bell of Cornell University, US. Mars and Earth are close because Mars is in opposition. The Sun is on one side of the Earth and Mars is on the opposite side. Mars oppositions happen every two years or so but this one is special because the two planets are about as close as they can get. Calculations suggest that the last time they were this close together was when Neanderthals roamed the planet, on September 12, 57,617 BC to be precise. Other significant encounters happened during the month of August in 1924, 1845 and 1766 but there won't be another close approach for 284 years. The close encounter is a consequence of the orbits the Earth and Mars take around the Sun. Earth has a more-or-less circular orbit while Mars takes a more elliptical path around the star. 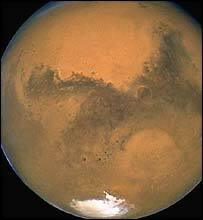 The two planets travel at different speeds around the Sun, the Earth eventually catching and overtaking Mars. This means Mars passes closer to Earth than usual at various times in history, with the 2003 opposition being particularly memorable. Mars can be seen in the night sky from anywhere on Earth with the naked eye but stargazers at lower latitudes will have the best chance of a spectacular sighting. Sir Patrick Moore, presenter of the BBC's Sky at Night, said: "You can find it easily, it is so bright, in the south at midnight, you can't mistake it, bright and red." Cloudy weather could obstruct Wednesday's view in some parts of the world but there will be other chances to get a good look at Mars. The planet has loomed large in the sky since July and will continue to be unusually big and bright for the next few weeks. Mars will appear as a red disc. Surface details, such as its southern ice cap, can be observed with even a modest telescope. Space agencies have taken advantage of this year's Mars encounter to shoot probes at Mars. Four space craft are on route to the Red Planet - two Nasa missions, Europe's Mars Express and a Japanese orbiter. Mars Express, which was launched in June, has almost reached its halfway point. It has flown about 24 million km and has some 32 million km left to travel.